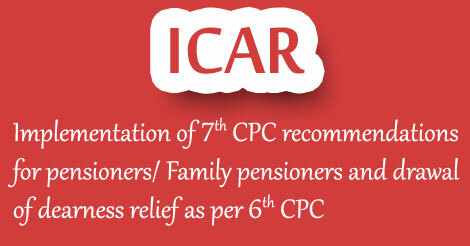 Sub: Implementation of 7th CPC recommendations for pensioners/ Family pensioners and drawal of dearness relief as per 6th CPC-regarding. Large numbers of representation/Letters have been received from the pensioners/family pensioners/retired employees have been received from various sources. The Government of India-Ministry of Finance, Department of Expenditure vide OM No. 1/1/2016-E-111-(A) have already extended the benefits of 7th CPC to the Autonomous Bodies for serving employees. The GOI has issued instructions vide letter NO. 38/37/2016- P&PW(A) dated 4.8.2016, Ministry of Personnel, Public Grievances & Pensioners, Department of Pension & Pensioners Welfare, New Delhi for Central Government Retired Pensioners only. Since, the instructions has yet not been issued to Autonomous Bodies for extend the implementations of 7th CPC to retired Pensioners/Family Pensioners, the Council has written ID note vide DARE/ICAR U.O.No.FIN/10/02/2017-Pension dated 02.03.2017 to seek the clarifications on the subject cited above. The reply is awaited in this regard.